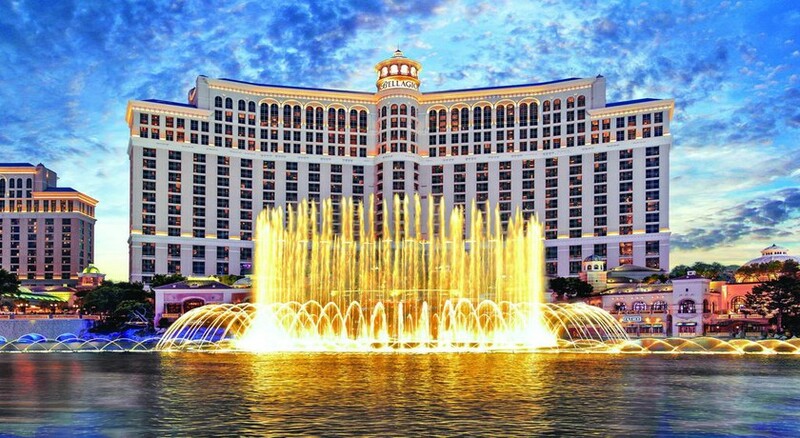 Crowned as one of the most iconic landmarks along the famous Strip, Bellagio Las Vegas is a lavish 5-star resort ideal for Las Vegas holidays. A luxury resort & casino in one, Bellagio is inspired by the grandeur and architecture of beautiful Lake Como in Italy and is world renowned for its elegance, sophistication and 5-star service. Among Bellagio's many highlights, there is an 8 acre-long lake on the hotel grounds with a large synchronised dancing water fountain. Inside the hotel, Dale Chihuly's Firori di Como, a hand-blown glass flower sculpture which covers almost the whole of the lobby ceiling for a spectacular entrance. The hotel comprises of 36 floors with a variety of chic bedrooms including Fountain View Queen, Fountain View King, Resort King, Resort Queen, Strip View Rooms and more. Located in the heart of The Strip on the corner of Flamingo Street and Las Vegas Boulevard, Bellagio combines luxurious guestrooms appointed with custom European-style furnishings, art, modern-day conveniences and spectacular views of Las Vegas and the surrounding mountains with world-class entertainment, restaurants and its own glass-enclosed shopping experience with several world-famous designer stores. The hotel is located on the famous Las Vegas Boulevard. Las Vegas’s McCarran International airport is 2.3 miles away, with quick and easy access to the hotel by taxi, a shuttle transfer, a bus or a private transfer from the hotel. 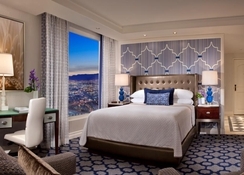 Bellagio’s newly remodeled rooms and suites offer guests a fresh, elegant collection of newly redesigned deluxe accommodations. Following Bellagio’s $70 million redesign of 2,568 guest rooms in its main tower in 2011, the Spa Tower underwent renovation in 2012. The renovated rooms are plush and luxurious. They come in different sizes and have a variety of categories such as fountain view king, fountain view king, resort king, resort queen, resort tower king and so on. 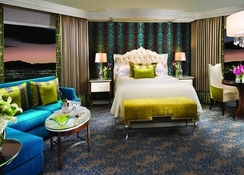 The suites include types such as salone strip view suite, cypress suite and two-bedroom Bellagio suite. Facilities include king or queen sized beds, spa amenities, flat screen TVs, bath robes, generously stocked mini bars, ergonomic desks or workstations, high-speed internet access, en-suite bathrooms, organic carpeting, LED lights, make-up mirrors, powder rooms, automatic drapery with sheer controls and more. 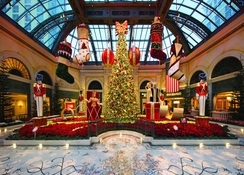 Bellagio features Michelin-star and AAA Five Diamond restaurants such as Picasso and La Cirque. Savor Chinese cuisine at Jasmine and experience steakhouse dining at its finest with superb steak, seafood and lamb at Prime Steakhouse. Other restaurants include Circo, Sensi, Yellowtail Japanese Restaurant & Lounge, Todd English’s Olives, FIX, and Noodles. The exceptional flavors of Bellagio are also available 24 hours a day at the signature Cafe Bellagio, overlooking the Conservatory and Botanical Gardens. 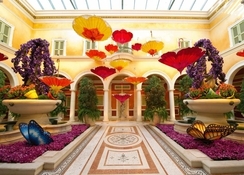 From circus acts to art galleries and casinos, the options of things to do at Bellagio are endless. Cirque du Soleil weaves an aquatic tapestry of artistry, surrealism and theatrical romance in the timeless production, “O”. The cast of world-class acrobats, synchronised swimmers and characters perform in, on, and above water to create a breathtaking experience in a theatre reminiscent of a European opera house. 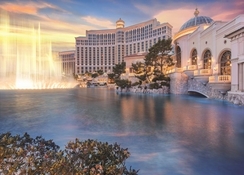 Bellagio Gallery of Fine Art is Las Vegas’ premier exhibition space committed to presenting intimate exhibitions featuring works by some of the world’s most compelling artists. Hyde Bellagio is the premier nightclub, and performances by world-famous DJs, live shows and a VIP treatment make it the place to be when the sun goes down. If you're in need of some R&R, the Las Vegas Spa and Salon is set in an area of 65,000 square feet, with spectacular services sure to pamper you.